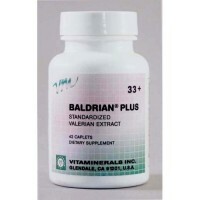 Vitaminerals Baldrian plus has a record of providing fast, effective relief from muscle spasms, trauma, sprain, strain or other musculoskeletal conditions. Baldrian Plus is standardized using K-K units, the only measurement of biological activity to provide consistent dependable results. 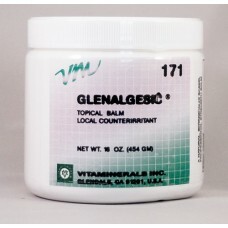 Glenalgesic provides warm soothing relief for muscle aches and pains from overexertion, fatigue, injured joints and arthritis. 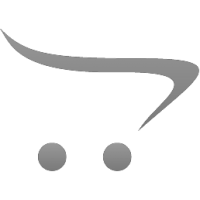 Vitaminerals Glenalgesic delivers natural salicylates from Oil of Wintergreen, natural aspirin directly to injured and painful areas, combined with the warmth from natural extracts of Camphor and Menthol for long lasting action. May also be used prior to exercise to increase blood flow and relax stiff muscles.Camphor - used topically to increase local blood flowMenthol - can be used to temporarily relieve minor pain..
Glucosamine Chondroitin may be beneficial for those suffering with Arthritis and Joint PainGlucosamine Sulfate and Chondroitin combined with natural anti-inflammatory agents, White Willow (natural salicin), Boswellia, Turmeric, (source of curcuminoids), and Bioflavonoids. Provides the pharmaceutical grade proteoglycans necessary for healthy intact cartilage and joint tissues with standardized botanical extracts to supply a nondrug response for both acute and chronic conditions.White Willow - historically used throughout history to relieve pain and feverBoswellia - traditionally used to treat respiratory ailments, joint pain, and inflammation. 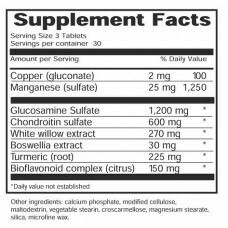 3 tablets provide:Glucosamine Sulfate1,200 mgChondroitin Sulfate600 mgWhite willow extract270 mgBoswellia extract30 mgTurmeric (root)225 mgBioflavonoid complext150 mgCopper2 mgManganese25 mgOther ingredients: cellulose, maltodextrin, vegetable stearin, manesium stearate, silica..
Prosomnia is a spray that contains soothing ingredients to encourage a night of peaceful rest. Vitamineral’s Prosomnia formula contains chamomile, passionflower extract along with Melatonin to help promote the onset of sleep and regulate sleep patterns. ..